No, not in the large house in the photograph – that’s long gone. As far as I can determine our house is approximately where the star is. Vestiges of some of the structures still remain, one of them as a wall on the edge of our property. We were told (don’t know if it’s true) that the other side of the wall was once a rose garden. Our friends Ken and Doreen Cross have a house, which is located where the lawn is in the picture. Their neighbors house was built on the site of the mansion, some pieces (e.g. the front steps) of which seem to have been incorporated into the more recent structure. 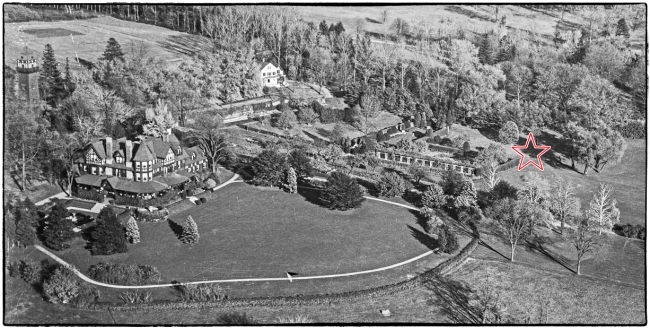 The whole estate was landscaped by Olmstead Brothers, founded by John Charles Olmsted and Frederick Law Olmsted, Jr. the nephew (and adopted son) and son of Frederick Law Olmstead the famous architect of New York’s Central Park. He also had a house in New York City, specifically at 1058 Fifth Avenue. I have been unable to find any photographs of the interior of Waldheim, but the Museum of the City of New York (Speyer was one of the founders) has a number of photographs of the interior of the 1058 Fifth Avenue Residence. If Waldheim was anything like this it would have been quite opulent. This entry was posted in Black & White, Buildings/Structures, Places. Bookmark the permalink.